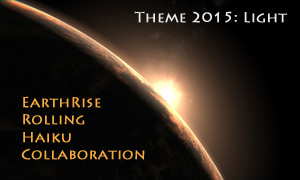 You are here: Home / EarthRise Rolling Haiku Collaboration / Getting Closer! The inaugural EarthRise Rolling Haiku Collaboration begins at 12:01 A.M. at the International Date Line, and rolls throughout the day. You’ll find a “seed” haiku on the blog at that time, on this year’s theme: Light, in celebration of the International Year of Light. Add your poem(s), in response to the previous post, or start a new thread on the topic of light. Ideally we’d like you to do this at dawn wherever you are, but we’re flexible — do it when you can, and as often as you like. The results will become a permanent archive on the THF site. Be a part of it — celebrate International Haiku Poetry Day, April 17, 2015.
can I not write about it? first light . . . I hope this is the right place to post our haiku. singing bowl . . . Sounds like a great project! Why does the supposed haiku at the top of the page have the wrong number of syllables? Hi Elena: The haiku at the top has exactly the right number of syllables! You are probably wondering about the “syllable count,” the idea that haiku must have three lines of 5, 7, and 5 syllables. In fact, this topic has been debated for the better part of a half-century, and the consensus by a huge majority is that, due to the fact that English syllables and Japanese “on” are so different, there is really no equivalency between them. An English-language poem of 10-12 syllables is about comparable to a Japanese-language poem of 17 “on.” (This is hugely oversimplified, but to those who have considered the matter over the past half century, it’s a complete non-issue, and this is not the place for such a conversation.) In any case, most of the English-language poems you’ll find here and elsewhere in contemporary practice will not concern themselves with this, and you needn’t, either. Please feel free to respond as you like, and have fun! So, ideally, the ‘EarthRise Rolling Haiku Collaboration’ on ‘International Haiku Poetry Day’ would begin to roll from somewhere around Honolulu, Hawaii (USA) on April 17th, moving to approximately Anchorage, Alaska (USA) and so on and end around Auckland, New Zealand (the time zone for which is *ahead* of Honololu by about 22 hours) the next day? So different to the ‘rolling’ midnight New Year’s Eve international celebrations or even the religious holidays of the various world religions! The international Date Line, as far as working out time goes, is a confusing can of worms! – Lorin, Melbourne, Australia, where at time of posting it is 1:54pm AEST, Thursday 16th April, 2015. Hi Jim, So, if I get this correctly, the entire collaborative poem will consist of “comments” on your seed haiku? Hi Bryan: As you’ve probably already seen, you can comment on the seed poem, or comment on any of the previous poems, or start a new theme of your own. All we ask is that the poem(s) concern themselves with light. Have fun! Thanks, Jim. I had to look for the “seed poem” — think it should be at the top of THIS page. But anyway, this looks like fun. Will be interesting to see how many people participate. What is the “cutoff”? When the entire world has finished with April 17?! Owner of a small store in Walnut Creek, Ca. named MING QUONG which means, RADIANT LIGHT. Your theme interested me. Ming Quong is named after the Chinese girl’s orphanage where I was raised in Los Gatos, Ca. ————— Here’s is my haiku. Wonderful! I plan to join in. I’m really excited about this event! I’m not too sure I understand the time thing. Is it one minute past midnight for me here in Ireland or do I have to calculate time differences? Hi Marion: No need to calculate time differences, just respond in whatever timing works for you, and have fun! Such a wonderful idea! We Canadians will need to spread some “Northern Lights”. 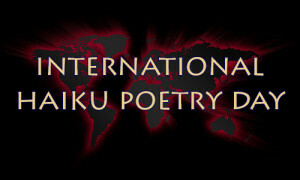 Look forward to seeing posts from a wide range of people at 12:01 A.M. at the International Date Line onwards on International Haiku Poetry Day, April 17, 2015. Sounds interesting. I’ll have to look into this. Wonderful idea. Keep it up – Haiku Foundation. This could be a novel, global haiku conversation! I look forward to it, very much.